Few readers for the extreme right-wing’s disinformation. 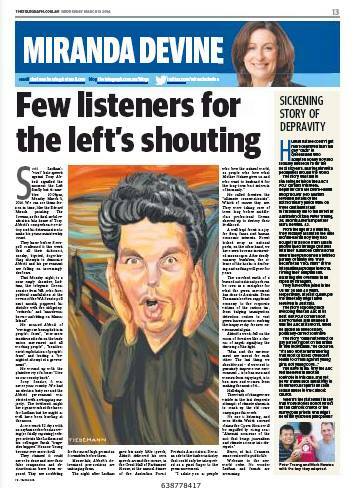 Miranda Devine’s hate speech, and obfuscation against Scott Ludlam signal the moment the extreme right-wing has finally lost it’s credibility for all time – Tuesday, March 11, 2014 (11:57pm). We can see slithering greasily, and maliciously the reliance on the rules of disinformation is, as always, a malevolent journalistic force on par with the most distasteful in living memory; Miranda Devine. An ironic force of fate begot her a surname reminiscent of the universal forces of good. There is nothing that would suggest it in her venomous bile of an article that somehow passes for credible journalistic commentary for page 13 of The Daily Telegraph. Her style mirrors the ham-fisted comments made by the right-winged trolls lurking in the comments beneath the video of Mr Ludlam’s speech on YouTube, whereby they attempt to shame the average observer, uneducated in the facts into compliance with their views via ridicule, personal attack, and negative spin against Mr Ludlam, and implying mental deficiency in those who disagree with them. Not one shred of credible, verifiable evidence is offered in support. A common tactic used by perpetrators of institutional, and domestic abuse is abuse by proxy. The subject of the abuse (in this case Scott Ludlam) is excluded from utilising popular mediums of distribution of the facts (mainstream Murdoch media), and discredited with a deluge of half-truths, outright lies, and emotive associative arguments with no substance in that same medium by the person who has selected them as a target. The audience for this discreditation is then unwittingly engaged as a force of proxy abuse when they repeat the misinformation ad nauseum, propelling it into popular sentiment. Another common feature of abuse in the discreditation phase is using the ‘crazy’ label in a lame, lazy attempt to dismiss someone’s ideas without actually examining the facts, or their logic. It’s a common tactic of abusive people as it plays on peoples fears, and prejudices. Quite frankly it’s beneath contempt. It is blatantly obvious to me, and to most people with an IQ over 100 that the strategic placement of Ms. Devine’s article adjacent to one regarding the abuse of an adopted child by his gay parents on page 13 of The Telegraph is meant to infer that homosexuals are predisposed to pedophilia, and that by association Scott Ludlam’s remarks regarding Mr Abbott’s homophobia are in fact an endorsement of a system that supposedly supports this. It is a shameless attempt to manipulate the public perception of homosexuals, and this man alike, in the most degrading, disgusting way possible. How this filth passes for journalism I cannot countenance. How it passes for propaganda I most definitely can. The fact remains, that although the bellowing cacophony of discreditation of the Greens is seemingly ceaselessly, and monotonously spewed forth in mainstream media Scott’s final speech to the federal Senate before the historic by-election bestowed upon Western Australians by misadventure and happenstance has hit a rich vein of public sentiment and support. The fear of the right-wing made self evident by such hypocritical ventings has been noted.